Also known as somatotrophin, HGH is a key hormone that takes active part in cell reproduction, tissue repair, smooth functioning of the brain, building muscles mass, human growth, decreasing stored fat, increasing energy and vigor, and delaying the process of aging. As one ages, their production of HGH begins to naturally decrease (hence the need for synthetic HGH arises). While both Human Growth Hormone and steroids are used to bring improvement in one’s body, they are not the same thing. People often have a misconception that HGH is a steroid. HGH and steroids have completely different chemical compositions. Both HGH and steroids are classified as anabolic substances. Steroids are of two types: corticosteroids and anabolic steroids. Corticosteroids can reduce inflammation and swelling and are used by doctors in the treatment of inflammatory conditions like arthritis. Anabolic steroids are administered for performance enhancement by athletes and bodybuilders. They increase protein synthesis in the body. Before stating the differences between HGH and steroids, it is important to understand their similarities because this will help clear the misconceptions about HGH being a steroid. Both HGH and steroids are available for the medical treatment of hormone deficiencies (HGH is used to treat growth hormone deficiency, while steroids are employed to treat testosterone deficiencies). HGH and steroids are both synthetically produced and administered as performance enhancers (specifically muscle growth). However, with so many similarities, the two are not the same. Their differences are what set them apart from one another. What are the Differences Between HGH and Steroids? In the body, HGH mainly functions to promote the growth of muscles and the depletion of stored fat. Fat is burned directly by HGH when it is taken out of storage, transported to the mitochondria through the bloodstream, where it is oxidized into a source of energy (ATP). 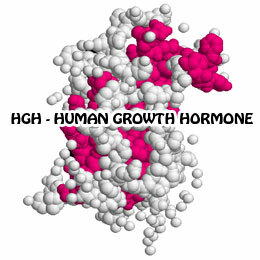 HGH increases muscular growth by reacting with receptors in the liver to transform into IGF-1 (insulin-like growth factor-1). It then binds with IGF receptors in the muscle cells for faster protein synthesis. On the other hand, steroids spread throughout the body via the blood and produce important changes to the skin, fat, skeletal muscle tissue, bones and certain areas of the brain. Anabolic steroids permeate through muscle cell membrane and bind with androgen receptors. Different steroids bind to receptors in different ways (some may be more effective than others). Growth hormone and IGF-1 bind to somatropin and IGF or insulting receptors respectively. Steroids bind to androgen receptors. This means HGH and steroid’s effects on the body are independent of one another, but are still complementary. HGH and steroids differ in the time they take to show results. While steroids show instant results, HGH is more gradual in this department. However, the effects of HGH are long lasting, while steroids only have a temporary effect on the body (lasting only 2 months on average). Steroids are better for gaining muscle, while HGH is better for burning fat. This is because HGH increases muscle cells by dividing existing ones and steroids are not as effective in fat burning as HGH is. The most common side effects of HGH are generally temporary (like carpal tunnel syndrome and high water retention); however, the side effects of steroids are much more damaging and even misusing them slightly can cause long term disorders (like problems with libido, acne, etc.). Moreover, the side effects of HGH are easier to avoid compared to steroids. Interestingly, steroids suppress the natural production of testosterone, while HGH does not suppress the production of growth hormone in the body. Steroids are much cheaper and widely available than HGH, because they are easier to produce and are available in the black market. HGH offers more versatile benefits than steroids apart from its main function of building muscles and burning fat. HGHis also helpful in delaying the aging process, increasing strength and stamina, enhancing vitality, treating trauma and so on. HGH is much easily accepted by the body. It is incorporated into the body’s normal cycle and does not cause any withdrawal symptoms. However, steroids are not as easily accepted and cause serious withdrawal symptoms. Steroids are highly addictive substances and abusers often become addicts as well. Addiction coupled with severe withdrawal symptoms makes it difficult to cut off the steroid use. On the other hand, HGH is not an addictive substance nor does it present withdrawal symptoms, however, HGH abuse could lead to harmful side effects. Steroids and HGH are combined owing to their synergy effect (1 + 1 = 3) on the body, where HGH and steroids effect different receptors, so they could benefit the body faster and more efficiently. Additionally, the synergy effect allows for a combination of HGH and steroids to reduce each other’s side effects. For the best effect, controlled doses of the two must be used and one needs to adjust doses according to their cycle. The bulking cycle (where the dose promotes muscle gain) may include strong steroids (like Testosterone, Deca or Trenbolone) in combination with HGH, while the cutting cycle (where fat is burned) would include steroids like Winstrol, Anavar, and Trenbolone in combination of a higher HGH dose. Using HGH and testosterone combination is one of the most efficacious combinations in terms of body building and fat burning. Other benefits could include elimination of depression, restful sleep, decreased fatigue, decreased muscle and joint pain, a healthier metabolism, improved heart rate, increased bone density, increased sperm production, reduced stress, improved focus and memory, faster injury and illness recovery and so on. The combo of HGH and steroids must be consumed in a responsible way to ensure effectiveness and prevent damaging side effects. So, is HGH a steroid? The answer is no. HGH and steroids may have similar molecular structures, but they differ greatly from each other. HGH is a hormone that is both naturally and synthetically produced for smooth functioning of the body, while steroids are only synthetically produced (which is why they are not readily accepted by the body). While HGH has been observed to be the safer option among the two, both present their own unique advantages, which make each desirable in different situations. Both also havethe same abuse potential and different side effects.